Southern Rock lobsters (Jasus edwardsii) are harvested along the Victorian coastline. Rock lobsters are marine crustaceans and prefer to live in sheltered caves, under rocks and in crevices from close inshore to depths greater than 200 metres. Rock Lobsters are dark red in colour. They feed mostly during the night on bottom living invertebrates including small crustaceans and molluscs. Sharks and octopus prey on rock lobsters. The Rock Lobster fishery is Victoria's most valuable professional fishery. Where is the Rock Lobster Fishery? The fishery is divided into two separately managed zones: the Eastern Zone and the Western Zone. The Eastern Zone extends west from the New South Wales border (150o20'E) to Apollo Bay (143o40'E). The Western Zone extends from Apollo Bay west to the border with South Australia (140o57.9'E). The Victorian Government has jurisdiction over the commercial rock lobster fishery in Commonwealth waters adjacent to Victoria through an Offshore Constitutional Settlement Agreement with the Commonwealth Government. The main ports in the Eastern Zone are Apollo Bay, Queenscliff, San Remo and Lakes Entrance. ​In the Western Zone, most catch is landed through Portland, Port Fairy, Warrnambool, Port Campbell and Apollo Bay. How are Rock lobster caught? Southern rock lobsters are targeted in Victoria using beehive shaped pots. The pots were once made from tea-tree but now the favoured material is a steel frame covered with netting. The pots are baited with whole fish (pilchards or mullet) or fish heads (Australian salmon) that attract rock lobsters. The pots are usually set mid afternoon and hauled in the early the next day. ​The lobsters are measured as they are removed from the pot with the undersize ones being returned directly to the water. Wet-wells or tanks of seawater hold the live lobsters until the boat returns to port. 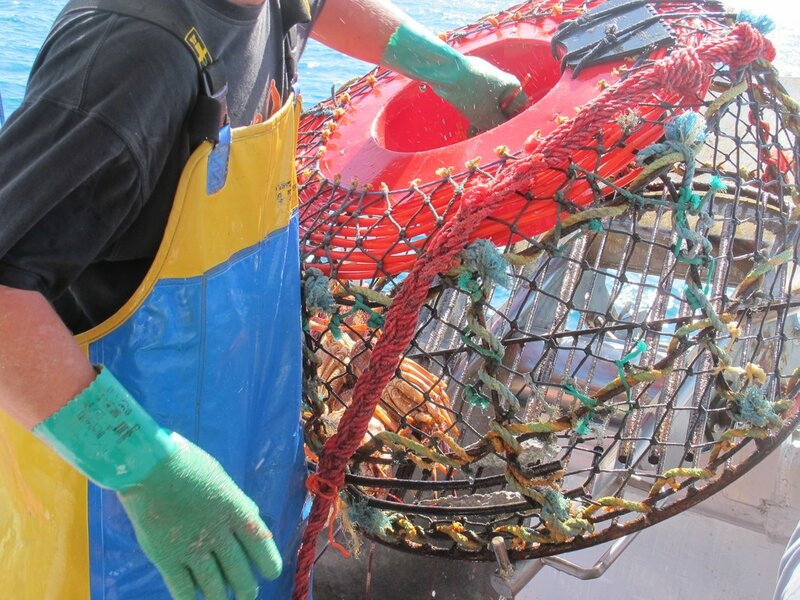 How is the Rock Lobster fishery managed? The commercial catch is regulated by ITQ units set by TACC. Further insight on the management of Rock Lobster is guided through the Fisheries Act 1995, the Fisheries Regulations 2009 and the Victorian Rock Lobster Fishery Management Plan. The potential impact of climate change on recruitment, growth and mortality has been identified as a risk across the range of the species (Pecl et al, 2009). The wide distribution of the species provides resilience to climate change as environmental factors important to settlement of juveniles, such as current strength or temperature are not consistent from region to region (Hinojosa et al, 2010). Recruitment, catchability and growth can vary substantially from year to year as a result of environmental changes, including changes in water temperature and movement of oceanic currents (Linnane et al, 2010). Below-average recruitment is not necessarily associated with low egg production—it can also result from unusual oceanographic patterns, which can affect larval survival, development and growth. Pecl, G, Frusher, S, Gardner, C, Haward, M, Hobday, A, Jennings, S, Nursey-Bray, M, Punt, A, Revill, H and van Putten, I 2009, The east coast Tasmanian Rock Lobster Fishery: vulnerability to climate change impacts and adaptation response options, report to the Australian Government Department of Climate Change, Canberra. Hinojosa, IA, Gardner, C, Green, BS, Leon, R, Jeffs, A and Linnane, A in press, Differing environmental drivers of settlement across the range of Southern Rock Lobster (Jasus edwardsii) suggest resilience of the fishery to climate change. Fisheries Oceanography. Linnane, A, Gardner, C, Hobday, D, Punt, A, McGarvey, R, Feenstra, J, Matthews, J and Green, B 2010, Evidence of large-scale spatial declines in recruitment patterns of Southern Rock Lobster Jasus edwardsii, across south-eastern Australia, Fisheries Research, 105: 163–171. The Southern Australia Southern Rock Lobster stock has been classified as ‘sustainable’ according to the 2016 SAFS report. This stock includes all rock Lobster caught in Victorian, South Australian, Southern Western Australian and Tasmanian waters.